It’s that time of the year again where many of us are coming down with a common cold or the flu. One moment we are feeling great and the next day we have chills, fever, headache, stiff neck, muscle aches, mucus congestion in the nasal passages and/or chest, sore throat, etc. Short of taking western pharmaceutical medicine to mask some of the symptoms temporarily, most people do nothing more than adding extra fluids and rest until it “runs its course.” In contrast, Chinese medicine takes a much more active role to eliminate the external pathogen in your body, address your underlying deficiency that lead to catching the sickness, and drastically shorten the time it takes for recovery. 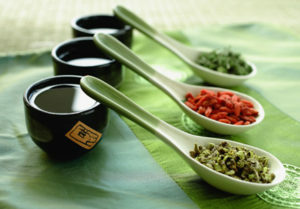 What makes Chinese medicine different from western medicine when it comes to treating viral and bacterial infections? How can acupuncture and Chinese medicine help prevent me from getting colds and the flu? I’m already sick. How can acupuncture and Chinese medicine help me right now? For thousands of years Chinese medicine has provided safe and effective methods for treating a wide range of diseases in the human body. It can be argued that Chinese medicine’s greatest strength, however, is in its herbal products used to specifically address common viruses and bacterial infections. Most western physician offices these days are overcrowded, expensive, and can provide inadequate treatment options that usually end with antibiotic prescriptions – even in cases of viral infections where these solutions are ineffective. This overuse of antibiotics has created a new breed of “superbugs” that has given rise to bacterial resistance like we haven’t seen before. Chinese medicine on the other hand is safer than drugs, doesn’t have harsh side effects, and can treat the infection while also strengthening the underlying constitution of the patient. In severe cases where antibiotics are needed and/or used, Chinese medicine can also be a great compliment to western medicine in helping to bring a balanced approach to health. In Chinese medicine, the etiology of the infection is understood within the context of the individual patient’s constitution. Simply put – this medicine strives to understand the complexity of each individual patient, instead treating only their disease. This individualized approach in Chinese medicine offers a wide variety of complex herbal formulas that naturally provide (among many other things) immuno-stimulant, antiviral, antibacterial, and/or antibiotic effects for your specific need. The quote above addresses one of the fundamental concepts in Chinese medicine that recognizes how most viral and bacterial infections adversely affect individuals with auto-immune disorders and/or weakened immune systems. Prevention is key in Chinese medicine and it is very complimentary to the same functional medicine approach taken at The Root Acupuncture – it strives to find the underlying cause of any disease and works to create a treatment plan that caters to the individual’s own constitution. 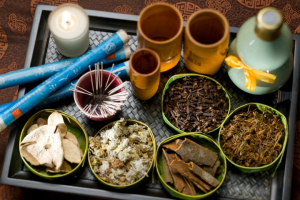 Many treatment options with acupuncture and Chinese medicine are adaptogenic. This means that it helps your body to create a natural balance or homeostasis, which aids in boosting your immune system to help combat any future pathogens that may try to invade your body. Acupuncture and Chinese medicine refer to your immune system as your “Wei Qi.” This protective barrier exists to prevent the body from being easily affected by external pathogens (colds, flus, and other infectious or microbial diseases). The strength of your Wei Qi is dictated by the overall health of your respiratory and digestive system (or your Lung and Spleen meridians, respectively), which is why we put such emphasis on repairing the gastrointestinal system at The Root Acupuncture clinic. Special consideration is always made for patients with auto-immune disorders like Celiac disease, immune compromised individuals, and patients with food sensitivities due to a leaky gut. Acupuncture – through the use of acupuncture needles, we create a healing reaction that is stimulated by the production of immunological mediators and neurotransmitters. Moxibustion – a traditional Chinese medicine technique that involves burning of mugwort (Artemisia vulgaris) to facilitate healing of the gastrointestinal lining, balance the intestinal flora, and stimulate the body’s immune system. Gua Sha – a technique of “scratching or scraping” the skin with a smooth-edged instrument in order to elicit transitory therapeutic petechiae (a redness of the skin). This causes a breakdown of hemoglobin that up-regulates HO-1, CO, biliverdin, and bilirubin, which exhibit anti-oxidative and anti-inflammatory effects. 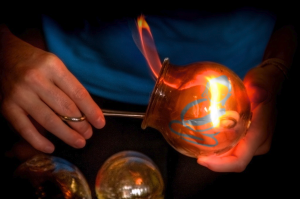 Cupping – made popular in the recent Rio Olympic games, cupping uses a partial vacuum that is created by fire in a glass jar, which is then applied to the skin. It helps loosen muscles and fascia, encourage blood flow, and is very effective in helping to clear congestion from a common cold or help with asthma. Chinese Herbs – there are literally hundreds of formula combinations in Chinese medicine that deal with just viral and bacterial infections. We carry a wide range of formulas that help your body with dealing a cold or flu at any stage of its development. At The Root Acupuncture, we use a combination of both Eastern Medicine and Functional Medicine to approach personalized patient health care from all available modalities – creating profound balance, harmony, and well-being in our patients. Acupuncture and Chinese Medicine add another amazing approach to helping us to overcome certain ailments like a common cold or the flu. Book an appointment today to help prevent potential viruses or the flu, or to see how this medicine can drastically reduce any symptoms that you are currently experiencing. *These statements have not been evaluated by the Food and Drug Administration. These products are not intended to diagnose, treat, cure, or prevent any disease. We recommend that you consult with a Traditional Chinese Medical practitioner before using any products or if you have any questions regarding your health. Cheng, Xinnong, and Liangyue Deng. Chinese Acupuncture and Moxibustion. Beijing: Foreign Language, 1999. Print. Maciocia, Giovanni. The Foundations of Chinese Medicine: A Comprehensive Text for Acupuncturists and Herbalists. Edinburgh: Elsevier Churchill Livingstone, 2005. Print. Xia ZW, Zhong WW, Meyrowitz JS, Zhang ZL. The role of heme oxygenase-1 in T cell-mediated immunity: the all encompassing enzyme. Curr Pharm Des. 2008. Print.